The start of the 2019 legislative session is coming up in just six weeks. County commissioners and the state lawmakers whose districts include St. Louis County are planning ahead to make the most of the upcoming session. The two groups will meet Thursday, November 29, beginning at 4:30 p.m. at BoomTown Wood Fire Grill, 501 Hat Trick Avenue in Eveleth. The meeting will include a discussion of the county's legislative priorities, as well as perspectives from area senators and representatives about what to expect in St. Paul in 2019. A similar meeting with the St. Louis County Legislative Delegation was held last year. It was the first such meeting in several decades, and all involved agreed it was worthwhile to bring together commissioners along with both the Duluth and Iron Range area delegations for pre-session planning. Increase funding for prevention and treatment of substance use disorders. Renew the Provider Tax that is scheduled to sunset in 2019. Without this funding source, the costs to cover people on Medical Assistance, MinnesotaCare and other public health programs would likely be shifted to counties and property tax payers. Eliminate cost shifts to counties for Children's Residential Treatment Services. Reform the Taconite Production Tax distribution to counties. Various other projects, including support for rural broadband, that are of statewide or regional importance. File photo from the 2017 meeting of the St. Louis County Legislative Delegation. 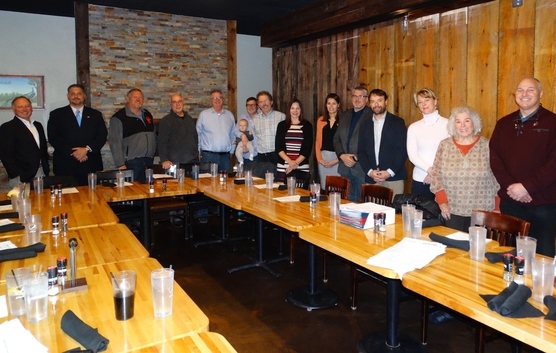 County commissioners and state representatives and senators whose districts include St. Louis County will meet again this Thursday at Boomtown in Eveleth.